ARTICLES & LINKS 28 Common Presentation Mistakes. Which are you making? 28 Common Presentation Mistakes. Which are you making? The best presenters and speakers continually hone their skills and test out new material. Regardless of how much presenting experience you have, don’t assume you have nothing new to learn. But don’t strive for perfection either. Instead, identify a few issues that you could improve upon and work on those first – starting with whatever will have the biggest impact on your presentations. So how do you go from average to outstanding presenter? 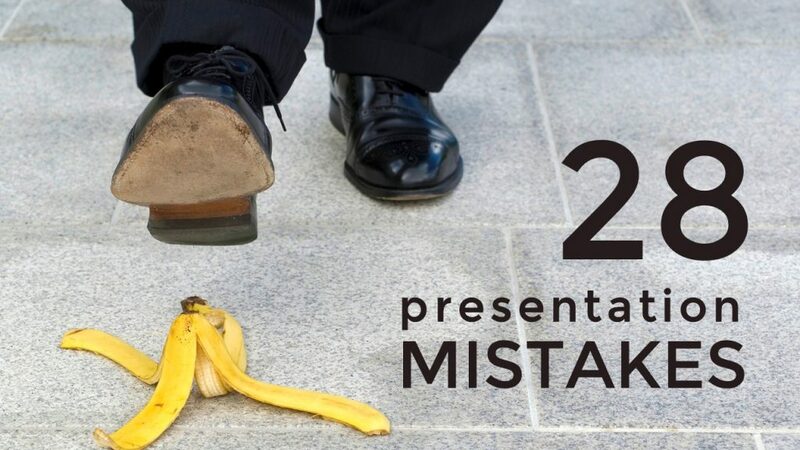 Have a look at our list of the 28 biggest presentation mistakes that most presenters make. Is there anything we missed? Make sure to start your presentations with impact. Saying, “Welcome, my name is ___. Today we will be talking about…” is boring. 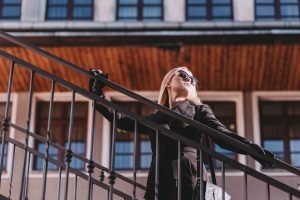 Do something different – be bold, creative, inspiring! And arrive early so you won’t feel flustered, which will carry over into your presentation. Most importantly, be interesting! What do your audiences want? Before you even think about creating a presentation, know what your audience is struggling with so that you can solve their problem or address their concerns. If you can’t be interesting, don’t bother speaking in front of people. We like to think that humans make rational decisions, but studies show that people make decisions based on emotion, and then rationalize their decisions afterwards. Your language needs to be appropriate for your audience. They can’t listen to you while they’re trying to figure out what you said. If you speak in circles around them, they may never fully catch up. If you can’t avoid the use of jargon or a technical term, be sure to explain what it means when you introduce it, and don’t introduce too many at once. Don’t use up an hour of time when 20 minutes will do. Respect people’s time and get to the point. Be concise and don’t ramble. But don’t rush, either. Yes, it’s a fine line. This is a simple matter of respect. If your presentation goes over your allotted time, there’s a good chance your audience will lose interest and leave anyway – or at the very least, stop listening because they’ll be focused on other commitments and trying to figure out how they will adjust. Your slide deck should help you stay on track. Use it as a guide to make sure you move logically from one point to another. In all likelihood, your audience can read perfectly well without your assistance. If you’re just going to read to them, you might as well save everyone some time and just send them a copy of your slide deck. This isn’t the place for a bedtime story. Challenge yourself to put as few words on the slides as possible, so that you can’t read from them. Could you do your entire presentation with only one word on each slide? If not, this is an indication that you may not know your materials well enough. PowerPoint gets a bad rap because 99% of slides are very poorly designed, but it’s not Bill Gates’ fault that the world lacks design skills! Just because a feature is available in PowerPoint, doesn’t mean you need to use it. In fact, when you start designing a presentation, it’s best if you don’t even open PowerPoint. Use Microsoft Word to create an outline first. Focus on the content and structure, and only when that is outstanding, move to PowerPoint and start designing your slides. If you don’t know how to design good slides, find someone who does or learn. While poor slide design probably won’t make or break your presentation, it can undermine your credibility and distract your audience – or worse – help put them to sleep. Depending on the type of presentation, you may want to consider the 10/20/30 rule from Guy Kawasaki. Ten slides for a 20-minute presentation with fonts no smaller than 30 points. It’s not appropriate for all types of presentations, but it’s a nice guideline and slide-to-duration ratio. Be careful when buying PowerPoint templates – while they may look pretty, more often than not, the design is not conducive to great presentations. The fonts are almost always too light and/or small to be read at the back of a room and the designers often cram too much on one slide. Buying presentation templates only works if you understand good design. Don’t trust that just because a “professional” designed it, that it’s any good. It can take longer to fix a poorly designed slide than to just build one from scratch. Ask yourself, “Why am I including this data?”, “What action do I want to inspire?”, and “If I removed this, could I still make my point?” to help determine if the data relevant enough to include. Even when used correctly, PowerPoint should not be your only tool. 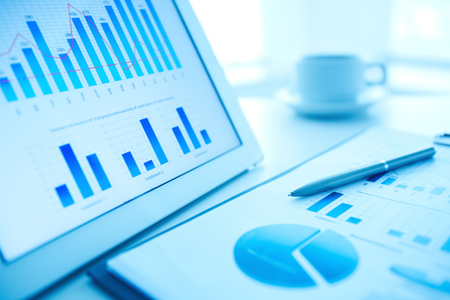 Use flip charts, white boards, post-it notes, and other tools to engage your audience. Try to break up the amount of time the audience spends staring at a screen. As the presenter, you are the least important person in the room. When you understand that and focus on the goal of helping your audience, you can eliminate a lot of the nervousness that comes with presenting. To be a great presenter, one could argue that you have to have a slightly inflated sense of ego and tough skin. It’s not easy standing in front of a room full of people (often complete strangers) who will critique your performance without knowing anything about you or the kind of day you’ve had. That inflated ego can be useful in protecting you when things don’t go well. But your ego doesn’t give you permission to act like you’re more important than everyone else. You’re the least important person in the room, remember? The best presenters are those who are authentic and who truly want to help people. Try to accommodate the organizers and see things from their perspective when they need you to adapt. Make it easy for people to work with you and they will ask you to come back. “Winging it” works well for very few people. The people who successfully speak without much practice are those who are fantastic natural speakers and who know their material inside out and upside down. 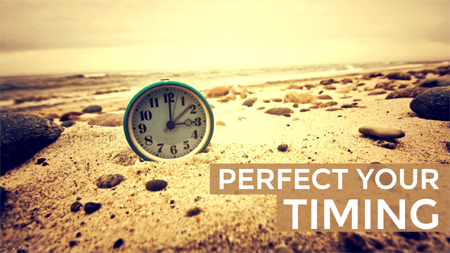 Even if you’re one of the lucky few, you need to get the timing right – so practice anyway! When you’re having an “off day” it’s natural to want to say something like, “I didn’t sleep well last night so forgive me if I seem tired.” But when you do that, you’re undermining your own credibility because your audience might not have even noticed you were tired. But now that you’ve drawn attention to it, they will focus on it, look for clues, and may even include a comment on your feedback form. Don’t give them reasons to complain! There are no excuses for not preparing technology ahead of time. Make sure you’ve tested everything before your presentation. Always carry extra batteries for your presenter remote (if you use one). If you arrive late, you’re setting yourself up for failure and run the risk of starting off stressed, which can have a domino effect on the rest of your presentation. Many people struggle with vertigo, motion sickness, and nausea. Out of respect for those people, never move text; if you must animate it, the text should remain static on the screen as it fades or wipes in. This allows people to fix their eyes on a focal point and start reading before the animation finishes. Don’t make your audience follow bouncing, flying, zooming, spinning, growing, or floating text… or anything else for that matter! Transitions are quite unnecessary, but if you must use them, only use a quick fade. If your transitions are too slow, they’ll interfere with your normal speech pattern. Remember – no one will leave your presentation and think, “Wow, those animations were great!”. They will comment on the content and your ability to present it. And the food… or lack thereof. Connect with people on a personal level to build rapport and trust. People will remember your stories much more easily than they will remember any facts you present. Just make sure the stories are relevant to your presentation or you’ll risk annoying people for wasting their time. “So last Tuesday I was walking the dog and… or wait, was it Wednesday? No, it must have been Tuesday. Hmm, now I’m not sure. Oh, wait. I was wrong. Actually, it was Monday and I know that because I had just come back from the gym. Right. So, last Monday, I was walking the dog and…”. By now your audience is ready to pull their hair out. To make your stories more interesting, keep them succinct and only include relevant information. If you mess up unimportant details that don’t affect the outcome of the story, don’t correct it – just keep going. End strong with a punch line, a twist, a lesson, or a call to action. Obviously, you want to be sensitive to different cultures, but In North America, lack of eye-contact can make people distrust you. If making eye contact adds to your nerves, pick three main focal points around the room (one on the left, one in the centre, and one on the right). Move from one focal point to the other as you speak, making eye contact with a few people from each area. A pause is like the mount on a diamond ring. The diamond is the message, but the mount is what presents it to the world and helps it shine! Help your message shine with a well-placed pause. Humour can enrich any presentation, as long as it’s appropriate. Self-deprecating humour is almost always safe. Poking fun at yourself also helps put people at ease, and when you hear laughter, it can help you relax. This is a mistake that almost everyone makes. If you end with a Question and Answer session, what happens if you can’t answer the last question? What if the answer isn’t one the audience likes or wants to hear? Ending with Q&A risks ending on a negative note. Instead, do your Q&A a few slides before finishing up so that you can end strong. If you can recap your entire presentation in 5-10 minutes, why did you waste an hour of the audience’s time? Emphasize only the main ideas very briefly. What was the purpose of your presentation? Were you trying to teach something? Did you wan to persuade the audience to take an action? Whatever the goal, make sure to tell people what you want them to do next. Feedback is useless unless it’s anonymous. If you just want people to tell you how great you are, ask them in person. You’ll rarely find anyone who won’t be willing to tell a little white lie to save face. But if you actually want to improve your presentation skills, ask for honest, anonymous feedback in writing. This is where that tough skin comes in handy, but it’s the best way to learn. And over time, as your presentation skills improve, so will your feedback. To improve your presentation skills in a safe environment with the guidance and feedback of an experienced presenter, register for PMC’s Skills for Effective Presentations course. This workshop will help you gain the confidence you need to go from average to outstanding presenter – sign up today!